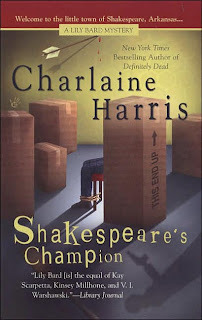 A few years ago I was twiddling my thumbs, waiting for the new Sookie Stackhouse book to come out, when I decided to see what else Charlaine Harris had written. Turned out she'd written a lot of other books, including three other mystery series featuring similarly intrepid heroines. My eye immediately settled on the Lily Bard series of mysteries also known as the "Shakespeare" mysteries because main character Lily lives in the small town of Shakespeare, Arkansas, and because each book has the word Shakespeare in the title. Up until recently all five of the Lily Bard mysteries were out of print, but then Berkeley Prime Crime re-released the entire series in very attractive mass market editions. My mom gave me the first one, Shakespeare's Landlord, as a Christmas present and I started tracking down the other four before I was even twenty pages in. A big fan of the Sookie books, I was instantly drawn to this darker, less humorous but no less compelling series. Since I reviewed Harris' most recent novel, Grave Secret, earlier this week, I figured this edition of Retro Fridays would be the perfect time to talk about this wonderful lesser known series in Harris' large body of work. Lily Bard isn't precisely in hiding, but she's flying as far below the radar as is humanly possible. After chopping her hair off, toning her body into lean, mean fighting machine, and then hiding it all under the baggiest and blandest of clothes, Lily decides to settle in the sleepy, little town of Shakespeare, Arkansas in an attempt to disappear. She chose Shakespeare at random off the map because she thought it was rather poetic given her last name. During the day Lily works as a cleaning lady, while at night she trains hard at bodybuilding and karate at the local gym. Every night she hopes it'll be hard enough to allow her to sleep. In her line of work, Lily is in and out of homes, apartments, and office buildings all across town. She sees and hears a lot more than she'd like. Most of it is just your usual small town gossip. But one night, while out on one of her frequent restless midnight walks, Lily sees something unusual. Someone pushing a cart filled with a large, lumpy something wrapped up in black plastic garbage bags. When Lily finds out just what is inside those garbage bags, she becomes inextricably immersed in exactly the kind of gruesome crime she's worked so hard to avoid. Once upon a time, years ago, I thought I was pretty. My sister, Varena, and I had the usual rivalry going, and I remember deciding my eyes were bigger and a lighter blue than hers, my nose was straighter and thinner, and my lips were fuller. Her chin was better--neat and determined. Mine is round. I haven't seen Varena in three years now. Probably she is the pretty one. Though my face hasn't changed, my mind has. The workings of the mind look out through the face and alter it. Sometimes, some mornings--the ones after the really bad nights--I look in the mirror and do not recognize the woman I see there. This was going to be one of those really bad nights (though I had no idea how bad it was going to get). But I could tell there was no point in going to bed. My feet itched to be moving. I dressed again, throwing my sweaty workout clothes into the hamper and pulling on blue jeans and a T-shirt, tucking in the T-shirt and pulling a belt through the belt loops. My hair was only a little damp; the blow-dryer finished the job. I pulled on a dark windbreaker. Front door, back door, kitchen door? Some nights it takes me awhile to decide. I worked my way through this series with palpable pleasure and it was a sad day indeed when I closed the fifth one knowing there would be no more. These are straight up mysteries with a Southern flavor, a fair bit of violence, intense encounters of all varieties, and a lot of grit. There isn't even a hint of the paranormal and all the energy goes into the character development and an honest depiction of a strong woman working hard to stay true to herself and keep the ghosts at bay. 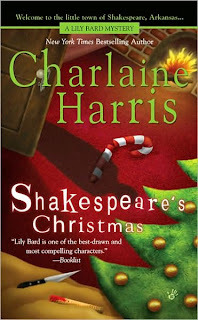 Like Harris' more recent Harper Connelly series, I think the Lily Bard mysteries deserve a good deal more attention and I hope those looking to branch out on the Sookie series will find a good home in Shakespeare. I certainly did. Good review I was thinking of giving these a try, and also possibly the Aurora Teagarden series. Great review. I bought the books as they were re-released but haven't read them yet. I was annoyed when Lily showed up in Sookie's world (I'm not a big fan of characters from one series showing up in another series) and haven't had the urge to read the Lily Bard books since. Do you remember when that happened? 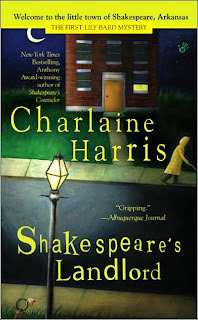 When my copy of Grave Secret arrived, I pulled Shakespeare's Landlord off the shelf, expecting to start a Charlaine Harris marathon - but I haven't done that yet. Thanks for sparking my interest in it again. Great review! I only read the southern vampire mysterious but this sounds good too! Vanessa, I totally understand. If you find yourself up for it, this series is utterly different from the Sookies. Worth a shot, I think. Caitlin, definitely do! I have the first Aurora book but haven't started it yet. It's been fun to see them re-release all her old stuff since the Sookie books have done so well. Karen, I do remember that! I was in a bit of a different situation though as I had read all the Lily books before it happened and so I was thrilled to see her and Jack pop up. But I'm a huge fan of character crossover, for some reason. Ever since Madeleine L'Engle did it so well with her Chronos/Kairos crossovers. Maria, yeah, I highly recommend them if you're in between Sookies and looking for something good. Well that just answered my question if this series was worth picking up or not. Thanks! And now I'm intrigued, when did Lily show up in the Sookie books? Was she one of the detectives trying to find out more about Debbie's death? I've seen these books being reviewed around. Thanks for the recap. Wow, I had no idea she had other books. I have been to busy with Sookie to notice. ;o) Thanks for posting this, I going to check them out! Serena, my pleasure! That's what these Retro Friday posts are all about. Tiah, I know! I was amazed to find her other series and see how good they are. Very worth your time. I have read PERCY PARKER and I did enjoy it. I was prepared to be quite bothered by her passivity, but somehow it never crossed too far over into helplessness for me. I don't know. I liked her meetings with Alexi and I'm hoping for more growth in book two. Let me know when you get to the Lily books! He he he......I thought you might notice....I need more Heroes! The series got me through our sick week at home. When is the next one coming out and how many are there going to be? Love Taro! Marvelous--I just finished reading a haunting book this morning and wondered what I should find to read next. I'm going right now to see if I can find these books! Liz, I'm so glad it got you through. That sounds like one bad week. Ugh. No word on the release date of the next one yet, though I'm guessing next summer sometime. She's got a contract for two more. Yippee! Taro rocks. Jessie, did you like the haunting book? Recommend it? :) Hope you can snag this series. Very, very enjoyable. Recently I read a book Shakespeare’s Truth by Rex Richards. I loved this book. For me it's the perfect combination - an intelligent, thought provoking but easy to read thriller. The significance of the time leap from the birth of a child to Queen Elisabeth II in the Tower of London to the brutal murder of a prince in the present day is only hinted at until the last chapter, creating pace and intrigue that kept me hooked. It left me thinking about the man we know as William Shakespeare, and how little people question his authority as a writer. If you enjoy books by people like Dan Brown, John Grisham, Ken Follett, Bernard Cornwell, and you want a page turner with serious food for thought… I’m pretty sure you’ll enjoy reading Shakespeare’s Truth!. I have posted the amazon link for book details. To Volga- Thanks for the information. I am a big fan of Shakespeare's plays and his books and the book you are talking about is more about Shakespeare and his hidden secrets. Is this available every where or only in UK..? I have also read this book but I am not sure about his availability. Well I not an UK based and so bought that book an e-book form author's website. You can also do this and for your reference I am giving you the site's URL link http://www.rexrichards.com/ .